When we last saw Lara Croft, she was growing out of being a victim. A victim of fate, of other people’s aggression, of her own uninspired previous playable incarnations. She’s still growing, but she’s different now. For most of Rise of the Tomb Raider, the second installment of a rebooted Tomb Raider series, Lara Croft doesn’t go around being scared. She still faces down overwhelming odds, grapples with doubt, and absorbs a ton of trauma. The newest iteration of the iconic video game heroine displays less fumbly panic than she did in 2013’s Tomb Raider. There are more moments of steely determination and fewer moments where she pauses to psych herself up. She knows what she’s capable of—she hasn’t forgotten that one time she wiped out a supernatural army, climbed a mountain, and took down a sun god. It feels like she’s grown. That feeling of growth is a key factor in this sequel. For Rise of the Tomb Raider to succeed, it needs to convince players that Lara has matured, but that she still has more growing to do. Yet the changes in a new installment can’t be too radical, lest this Lara become unrecognizable to old and new fans. Rise of the Tomb Raider tells the story of young Lara Croft, alone in a dangerous place, exploring ruins, solving puzzles, and shooting lots of guys with flaming arrows. It combines hunter/gatherer elements—where you need to scavenge for the stuff you need to survive or make weapons—with a mix of melee and ranged combat with pickaxes, guns or a bow and arrow. Rise opens yet again with Lara searching for proof of a time-lost civilization. This time, however, her motivations come from a deeply personal place. Before he died, Lara’s father was on a quest to find the Divine Source—an artifact said to grant eternal life—and the apocryphal Prophet who performed miracles with its power. Lara’s continuation of his work is directly linked to her desire to restore respectability to the Croft name—her father’s name. Her travels take her to a snow-swept mountain range in Siberia where she comes into conflict with a mysterious organization named Trinity, whose paramilitary goons are also looking for the Divine Source. Hello, cannon fodder. Crystal Dynamics’ latest effort at a Tomb Raider game benefits from smartly imagining the psychological underpinnings of both its heroes and villains. Just as Lara is trying to contend with her father’s legacy, the main bad guy’s thirst for power is likewise driven by very personal reasons. There are moments that you feel like you’re fighting against a screwed-up worldview and not just a bunch of artificially-intelligent mannequins. 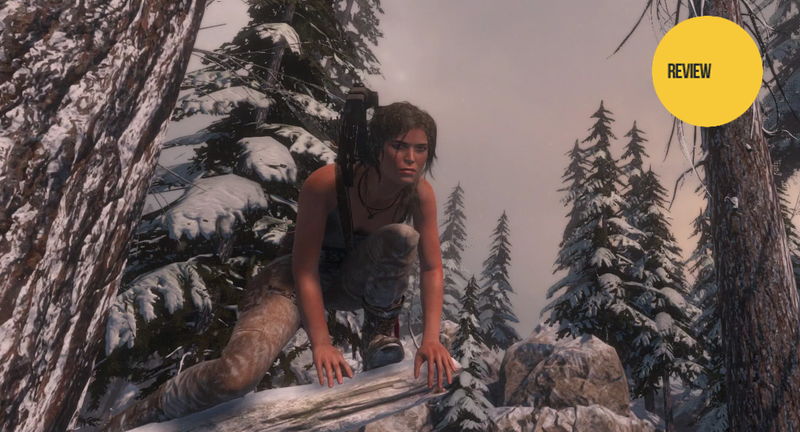 Rise of the Tomb Raider tweaks the gameplay formula established in its 2013 predecessor. There’s a new crafting system that has Lara constantly foraging for resources that she can use to make ammo, equipment or bandages. Once she has enough resources, she can craft what she needs on the go. The player holds down the left bumper and can craft, mid-action. So, collecting deathcap mushrooms lets her make poison arrows that release a fatal gas. Similarly, other new craftable items increase the ability to silently skulk through encounters if you want. If loud, messy combat engagement is your thing, then you can quickly turn bottles and cans into molotovs and hand grenades. 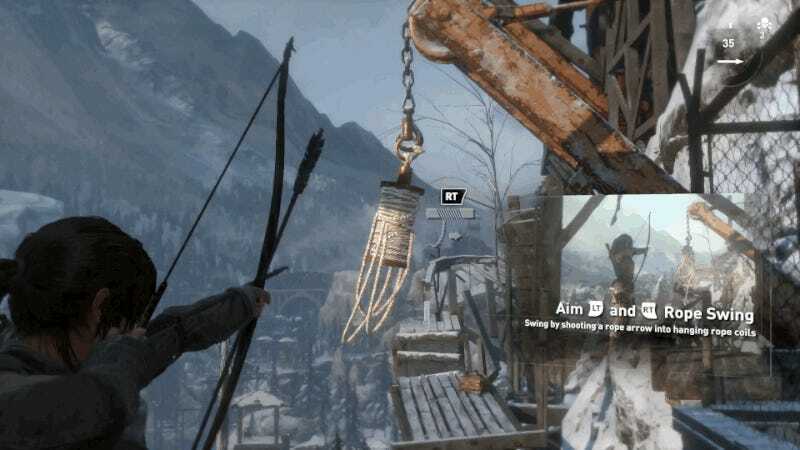 Lara’s newly improved abilities are a direct reflection of how much effort you put into exploring the gameworld. As her skills increase, her ability to spot resources and read the world gets more powerful. Lara buffs her mastery of ancient languages by finding murals and improves her arsenal and equipment by amassing exotic animal hides. Other combat upgrades let you pull off feats like multiple headshots at once with the bow. The way that ROTTR’s mechanics are structured feeds into the overall sense of growing or maturing. Aside from its opening chapters, Rise of the Tomb Raider is set around the geothermal valley in Siberia where Lara and Trinity have tracked the Divine Source. It’s a gorgeously layered landscape that feels more like an open world than the terrain of the 2013 game. Whether snowy or lushly green, the terrain feels alive, teeming with plant-based resources or animals to stalk (or flee). Aside from scads of posthumous testimonials about the history of its events and fiction, the game also teases players with optional tombs. The entrances to these tombs are secreted away and you’ll need to apply some extra effort to even find them. Once you find these tombs, you’ll be faced with a single physics-based environmental puzzle—familiar to longtime Tomb Raider fans. But you’ll need to navigate through various section of the tombs to trigger various elements necessary to their solution. As a result, they wind up feeling bigger and more significant. The game’s also got side missions—given to you by actual in-world quest-givers—that grant you new tools/weapons, like a lock pick and crafting tool. You can also use in-game currency to obtain some of these weapons and equipment from the supply shack that opens up in the first third of the game. Editor’s Note: We’ve refreshed this review for 2016 to coincide with the release of the game on PC. In the time between when we first reviewed it last November and now, we’ve revised our approach to reviews and removed YES/NO recommendations from our summary cards. The card above is one of the new ones; you can view the game’s original “YES” card here. This is an enjoyable sequel and the reason it’s very fun is because it feels upgraded in nearly every way. When I tried for stealthier approaches in the 2013 Tomb Raider, the results felt haphazard. In this game, I was able to plan and execute better, thanks to a plethora of options that let you blind or poison enemies from afar. The feeling of being a cunning predator was a welcome change for me, especially after enduring the emotional rawness of the last Tomb Raider. Another thing I liked about Rise of the Tomb Raider is how it constantly rewards your curiosity. If you head to a seemingly innocuous cliff or stop and take in your surroundings with Lara’s survival instinct, you’ll almost always find a resource or collectible waiting for you. I leaned hard on Lara’s survival instinct because Rise of the Tomb Raider is the kind of game where I didn’t want to miss a thing. I played Rise of the Tomb Raider much like I did its predecessor: almost exclusively with the bow and arrow and as stealthily as my patience would allow. This time around, however, I didn’t feel like a trembly twentysomething, scared of every shadow. I felt more like a hunter and explorer, systematically taking down enemies and challenges. That said, I didn’t like having to unlock the same suite of weapons as in the last game. Lara knew how to counter enemies and perform quick stealth kills in the last game—why should she have to re-learn it now? Unlike the Tomb Raider game from two years ago, Rise doesn’t have any competitive multiplayer. Instead, it offers another gambit geared to entice players to keep returning to the game. The Expeditions feature lets you play remixed chunks of the story campaign in one of four modes—Chapter Replay, Chapter Replay Elite, Score Attack or Remnant Resistance. So, a Lobotomy challenge tasks players to notch five headshots with the bow and arrow and using a Big Head card on enemies swells their craniums makes their torsos and limbs more resistant to damage. The credits you earn in Expeditions can be used to buy more card packs for increased variability in the missions you create. I enjoyed the handful of Expeditions missions I took on and the feature feels like a clever way of re-jiggering the work that’s already in the game. Rise of the Tomb Raider’s greatest success is in how it encourages exploration, which in turn makes you feel more connected to its fictional world. Every hapless corpse in the frozen Russian wastes is a reminder that Lara’s moving through a place that’s killed many others. As I played, she came across as increasingly gifted, with enough spirit and ingenuity to find ways to see herself through to the other side. This Lara isn’t a wide-eyed newcomer, nor is she a flinty veteran. She’s somewhere in between. Rise of the Tomb Raider makes me want to follow her where she goes next. For a second opinion, check out the TAY Review over at our reader-run blog, Talk Amongst Yourselves.